First off I will show you the schematics (layouts) I used. I have changed a few of the parts to suit my tastes or because I didn't have the part on hand so I just used the closest I had on hand. I want this pedal to have even vol when bypassed on low gain so it needs a make up volume stage . 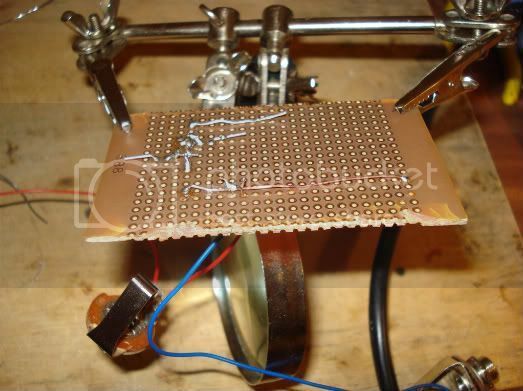 From the left ;The squiggly line with the arrow going into it is a pot (potentiometer). 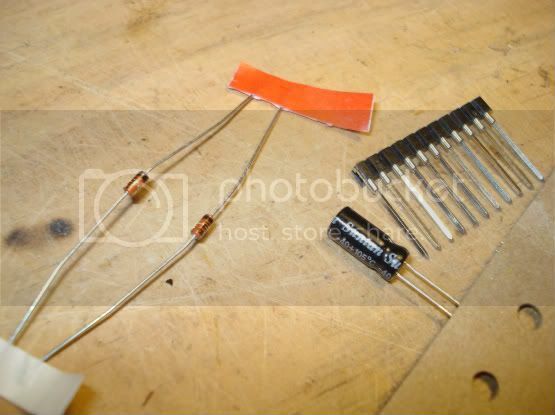 A variable resistor. It will not be on the circuit board so we will ignore it for now . 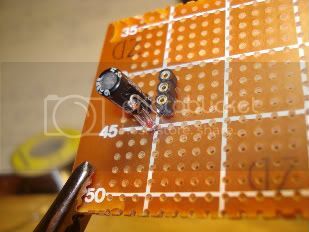 I started with the (cap) capacitor (in the schematic it's the image with the two blocks with a plus beside it) it is an electrolytic cap you can tell by the plus sign , and it has to go in with the plus facing a certain way . 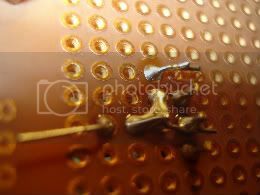 So put the cap in your PCB board like so. Note the Grey bit with the block on the cap ,that is the negative side of the cap . 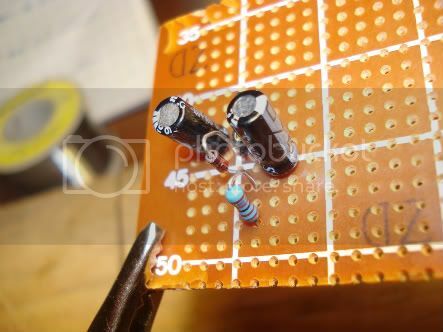 Then add the resistor and last cap (make sure it's round the right way , you will notice I did not snip one side of the resistor because that part will be connected to the 9 volts and so will other parts further on the board. I like to test it now before I go on just in case I have made a mistake . Makes it a lot easier to find out what's wrong with it at the end if it's not working. Put the transistor in the socket with the flat side facing the input cap (forgot to take a pic sorry). Then you are ready to test it. you could house it as is if you like it . I Will post the the rest in the next few days. if anyone "Has a GO" can they put up sound clips and any mods please? I've been wanting a bass fuzz for a while now, There isnt one on my multi fx. Ha. I never got around to posting the rest. But if you get as far as I went you should be able to figure the rest out. I did make it, And the bottom end was not the best...Because of the input and output caps on the gain make up stage.is my guess I have made the fuzz and tone schematics in others and they are fine. If I did this one again I would try 4.7uf caps instead. Should work, I think. 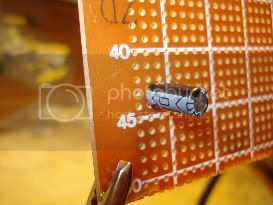 Here is how to true bypass with a LED. Thanks for the offer but I've already got a few. These are just the parts for the main fuzz unit, I'll make this first then, all things going well, I'll add the other bits. Last edited by Jake on Tue Aug 02, 2011 12:18 pm, edited 1 time in total. 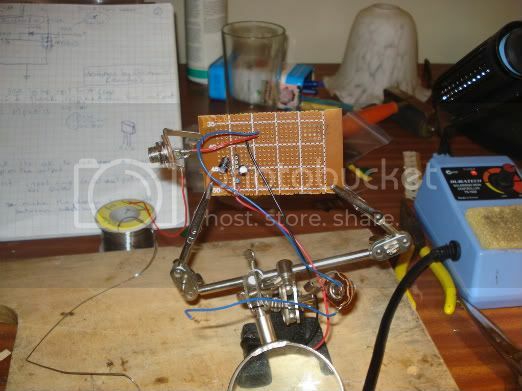 Yeah it does change the character, I have tried the odd diodes silicon and germanium as well as LEDs. 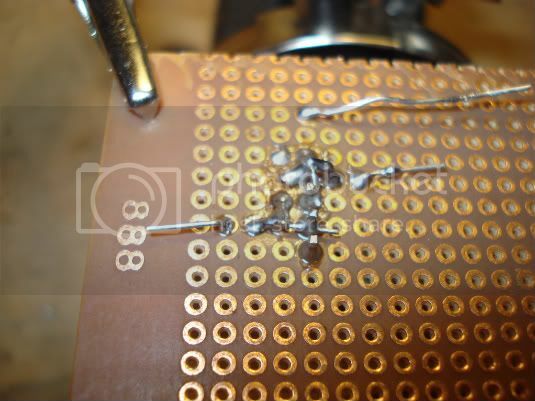 You could use the socket things instead of soldering in the diode, so you can have a play around.